Regular readers will be aware that last year I did a group test of 300B valves using my Audionote Quest Silver monoblock amps to carry them. The group comprised valves from Audion, Audionote, Electro-Harmonix, Svetlana, JJ and TJ, you'll need to go back to that review for much of the background that otherwise would be in this review. Inevitably, despite the long list some contenders were missing and the KR300b notable amongst them. 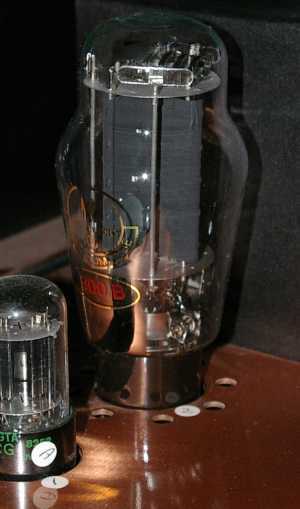 So you can imagine I was pleased to hear from KR and receive a pair of their valves to 'add' to the 300b review. The KR's came in a beautiful box that would shame most manufacturers - a small point I know, but it's a good sign and the contents were also very well protected. These are the best made 300bs I've seen. The glass is thick and even and firmly attached to the base - I know you should never remove valves by pulling on the glass, but some amp designs make it impossible to do otherwise - indeed it's not that easy with the Quests. I had total confidence in doing this with the KR's, not with others. The gold-plated pins were well made and parallel (unlike the TJ mesh plate) and the internals chunky and even. Even the screen-printed logo looked better than the competition. Also the glass envelope is standard size and shape (the JJ's are considerably bigger) and the valve simply a drop in replacement for any 300b. All in all first impressions were extremely positive. Nice :-) From my previous review you'll see that the valve I kept for my own use was the JJ. Though it could be pushy at times it's transparency and openness couldn't be beaten and it's tough to give up this kind of insight for the sake of an 'easier listen'. The much-vaunted TJ Meshplates sounded warm and slugged in comparison (and were noisy). The KR300b managed to split the two, not by falling between two stools, but by giving the insight of the former but with a gentle and natural presentation. Over a period of weeks I realised that though never sounding edgy they managed to drag all the information off the recording just as the JJ did, and just as important, retained the wonderful feeling of space and atmosphere. I suppose the best description would be of ease, where the JJ's could make you wince at times, the KR's seemed to take everything effortlessly in their stride. They reminded me most of the Electro-Harmonics in balance, but with an overall ability well in advance in all areas. The icing on the cake being that the KR's are also the quietest valves I've had here which in my system is important, as with 104dbl speakers any noise is irritating.